Protecting Erie: By residents, for residents. An aerial view of the Champlin 41-4 #1 tank battery spill, taken on February 19, 2018. On February 12, 2018, historical impacts were discovered during abandonment activities at the Champlin 41-4 #1 production facility. The release became State reportable on February 14, 2018, due to the quantity of impacted soil excavated. Soil excavation activities are ongoing and will be summarized in a forthcoming Supplemental Form 19 Spill/Release Report. Here’s a timeline of the events surrounding the State reportable release at the Champlin 41-4 #1 production facility, operated by Kerr McGee, a wholly-owned subsidiary of Anadarko Petroleum. These flowlines were removed from the site by January 29, 2018. Anadarko files a report with the COGCC indicating flowlines have been removed from the tank battery. From the Form 19 report filed by Anadarko, “historical impacts were discovered during abandonment activities” at the site. The release becomes “State reportable on February 14, 2018, due to the quantity of impacted soil excavated. Spills/releases of E&P waste or produced fluid exceeding five (5) barrels, including those contained within lined or unlined berms, shall be reported on COGCC Spill/Release Report, Form 19. While the reported quantity of spilled oil is greater than 5 barrels, an upper bound on the amount spilled has not yet been supplied by the operator. They are required to report this in a supplemental Form 19. On February 16, Anadarko notified the Town of Erie of the spill, which alerted us in the community, at the Erie Protectors, and the media of the incident. On February 18, Christiaan van Woudenberg met with Bruce Finley of the Denver Post to take a look at the spill site. Read about it here. Christiaan van Woudenberg spoke with Joe St. George of Fox 31 News about the aging oil & gas infrastructure in Erie. On February 19, Christiaan spoke with Joe St. George of Fox 31 News at the site about his concerns. “We get desensitized to this. This is not normal, this is not OK,” he said during the interview. There were 619 spills in Colorado in 2017, and there have already been 83 spills reported in 2018. On February 19, a spill report was finally made available on the COGCC web site. We’ll update here once the supplemental report detailing the full extent of the spill becomes available. It looks like the mystery of a loud boom heard near Lochbuie, Colorado has been solved. Read on to see how we uncovered the COGCC accident report for this location. With the support of neighbors from surrounding communities, Erie residents voiced their concerns about the volatile organic compounds released at the plug & abandon operations near Aspen Ridge Preparatory School and the Kiddie Academy of Erie. This article is reprinted from the Holiday 2017 issue of Elife. Once again, Jennifer Kovaleski from 7News is in Vista Ridge to talk about fracking. This time, it’s the raw natural gas gathering lines being installed within 100 ft of existing homes by Anadarko Petroleum. Once they start building units in the Red Tail Ranch development, homes will be even closer to this line. The Erie Protectors hosted a community photo shoot to replicate a photo taken by concerned community members in December 2014 to protest Crestone Peak Resources’ activities at the Waste Connections and Pratt sites just north of Vista Ridge in Erie, Colorado. We had a wonderful morning meeting like-minded neighbors opposed to oil & gas activities in our neighborhoods. Fracking is not good for Colorado. 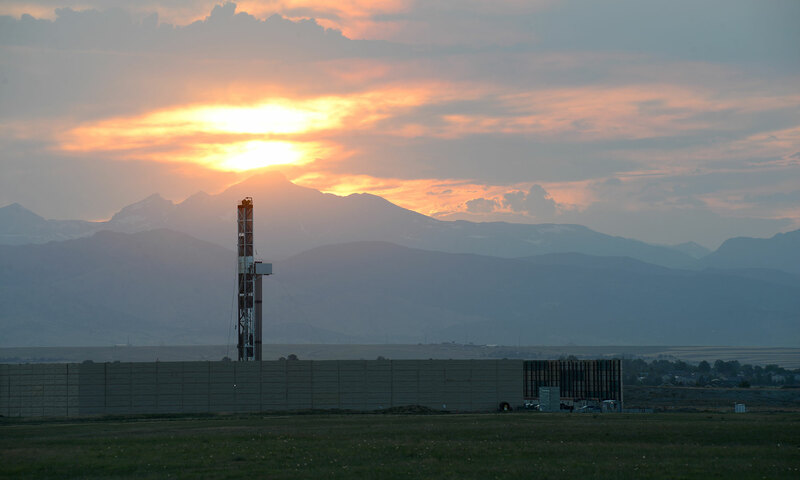 Even with its tough regulations Colorado has experienced earthquakes, a house explosion and continually poor air quality due to fracking and its waste water disposal. Read the full article at http://www.dailycamera.com/letters/ci_31321776/kim-miller-ritter-romer-should-encourage-renewables-not , and check out the numerous links she’s included to other resources and newsworthy items. Boulder County residents are mobilizing to show their opposition to a proposal by 8 North LLC, a subsidiary of Extraction Oil & Gas, who plan to drill on lands between Lafayette and Erie. Jennifer Kovaleski from Denver’s 7NEWS came to Erie to interview two residents about the odors and noise coming from the Pratt site just north of the Vista Ridge development in Erie, Colorado. On Tuesday, September 12, the Erie town trustees passed an ordinance requiring oil & gas companies to provide maps of all new and existing oil and gas pipelines in the town by October 2018.